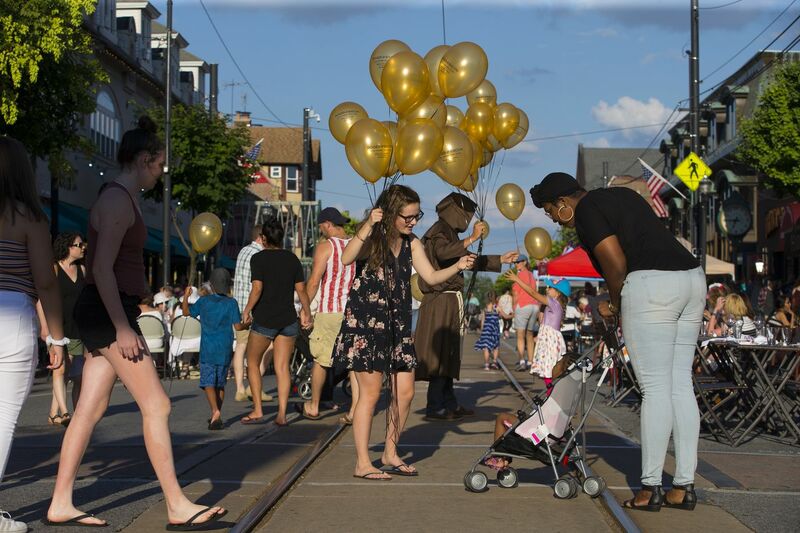 Ally Shearer hands out balloons for Media Eye Works on State Street in Media on July 18, 2018. Every Wednesday during the summer, State Street is closed to traffic for Dining Under the Stars. When Mike Hannigan used to say he was "going downtown," he meant Center City. But since moving to Media a decade ago, that phrase has taken on new meaning. To Hannigan and his family, "going downtown" now refers to the five-minute walk from their Delaware County home to the diverse array of restaurants that stretch down State Street and spill over into the surrounding community. "I kind of realize now that we don't get out of town much," Hannigan said with a laugh. "What we need, Media offers." The county seat has built a brand around the passion of its 5,000 residents and the lively, ever-growing restaurant scene. In the downtown area, dozens of restaurants draw diners from across the region, especially on Wednesday nights in the summer when the main drag shuts down for "Dining Under the Stars." (The al fresco event brings thousands of diners and generates more revenue for restaurants than a typical Friday or Saturday night, said Mayor Bob McMahon). And Media is only expanding, with luxury apartments and a state-of-the-art mixed-use development coming soon. Diners eat outside on State Street in Media for its weekly Dining Under the Stars. "I think what you're really seeing is pride in the community," said Brian Hall, borough council president. On the Visit Media website, folks can stock up on T-shirts, baseball hats, bumper stickers, or pint glasses that bear the slogan "Media, Everybody's Hometown." They can even watch an "I love Media!" YouTube video, outlining what there is to do and see and eat there. "Initially, Media was an area driven by the courthouse, kind of a smaller suburban downtown," said Michael Markman, a local developer and native of nearby Lower Merion. But today, the borough is "a cool place to go in the suburbs." Markman, president of BET Investments, is working on two projects that are slated to open in Media in the coming months: the West End Flats, an upscale apartment complex, and the Promenade at Granite Run, a town-center-like mixed-use development with shops, restaurants, offices, and luxury apartments. The West End Flats being built on West Baltimore Pike. About two miles from Media's downtown strip, the Promenade will sit on the site of the former Granite Run Mall, which was foreclosed on in 2011. The new complex, valued at more than $100 million, will include a TJ Maxx and a Michaels art supply store, as well as Boscov's and Sears, two anchor stores from the old mall. Also coming: Frank Theatres CineBowl & Grille, where patrons can see movies, go bowling, and play arcade games. "It is really leading the forefront of redevelopment of old malls," Markman said of the Promenade. The old Granite Run Mall is being turned into the Promenade at Granite Run. "That's really going to be something," said Ted Volikas, the owner of Pinocchio's Pizza, which opened in Media in 1955. Volikas' parents, Tom and Athena, bought the Baltimore Avenue restaurant 10 years later. The family has since turned it into a Delaware County landmark. Volikas, who was 13 when his parents purchased Pinocchio's, remembers when there were two main options for pizza in town: Pinocchio's and Apollo Pizza on State Street. Now, he said, there are countless pizza places, and restaurants, such as Iron Hill Brewery and Spasso Italian Grill, that have pizza options on their menu, he said. "The restaurants have just boomed," Volikas said. "A lot of people have said, 'Has that affected you?' Well, yeah, we've gotten busier. [Media] is a destination." The crowds have been making State Street in Media a destination. When McMahon got involved in local government 30 years ago, he said, Media was not a destination. Burglary rates were high, he said, and there were maybe six restaurants. By the time Hall and his family moved there in 1996, the borough was still a bit "down-at-it-heels," he said. At 5 p.m., the courthouse and surrounding businesses would close, and the town would empty out, Hall said. But then that council started planning, making an effort to attract restaurants and retail. Today, Media boasts 50 restaurants, 30 shops, and 45 other businesses in its three-quarters of a square mile, according to Hall. In the last decade, a diverse array of restaurants has moved in. The Bull Family — Canon, Alexander (top) and Camper — make their way along State Street during Dining Under the Stars. Spasso branched out to Media from its original Old City location in 2012. Tom's Dim Sum, the Chinatown mainstay, followed suit in 2016. Among Media's 2017 openings: a Greek restaurant, Yia It's All Greek to Me, and the sports bar Tap 24, which is run by the owner of three other Media restaurants. Two years ago, when the local gastropub Brick & Brew was looking to expand from its popular Havertown location, Media made perfect sense. Owners were attracted to the walkable downtown, as well as the evolving restaurant scene. "Media was certainly on the radar for awhile," said Marcus Dent, director of marketing for Brick & Brew. "We loved the idea of being right in the middle of historic Media." Charlie Cunningham, 4 months, is held up while his mother and friends dine at Dining Under the Stars. Mayor McMahon said he would love to see the shopping scene experience the boom that the restaurant industry has, and wants better coordination between restaurants, shops, and the Media Theatre. "A lot of this has been trial and error," McMahon said. On a summer Wednesday night, however, the thousands eating outside on State Street seem to be focused only on what is working for the borough. "Media is a great success story," Hall said, "and I think we'll continue to be one." The 101 trolley passes by the Media Theatre.